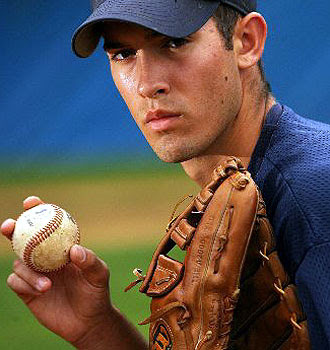 With Nate Robertson injured and Dontrelle Willis now on the disabled list with "performance anxiety" (sounds pretty bad) it appears that top prospect Rick Porcello has a very good chance to begin the season in the major leagues. Few who have seen him pitch doubt that Porcello would eventually be at the top of the Detroit Tiger's rotation. However, who knew it would come after just one full season in the minors? While we all hate it when teams rush young players, Porcello appears to be ready. He has always had an advanced approach to pitching and is very good at conserving his energy and keeping his pitch count low. He has a fastball that can hit 97-98 but prefers to pitch in the 90-94 range where he has greater movement. He could probably pile up huge strikeout numbers were that his preference but he would rather conserve pitches and induce groundballs. If you can live with middling strikeout numbers (I expect he'll be in the 5.5 to 6.5 K9 range) from a great groundballer, Porcello makes an excellent late-rounds selection.